ETA: Thanks so much to all of you who entered the giveaway! Congratulations, and I'll be in contact with you very soon! Today's my stop on Melissa's Simply Charmed Blog Hop! 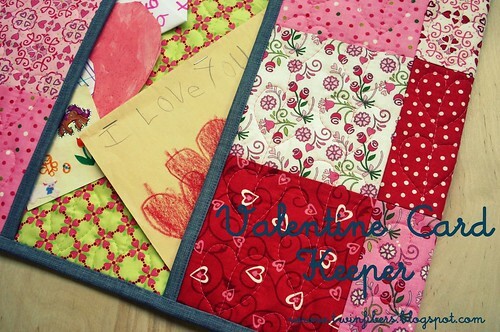 I'm going to show you how to make a quilted fabric envelope to keep all those special Valentine's in. I have a drawer will all these odd shaped love notes from my kids, and this will be a great way to keep them safe and organized. size: approx. 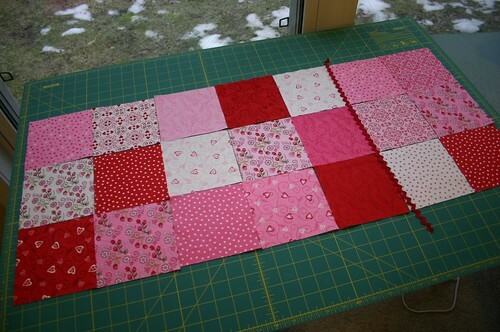 9" x 13.75"
First arrange your fabric squares in three rows with 7 squares in each row. The rick rack is going to be inserted in the second seam from the right, so you can place it there to get an idea of what it's going to look like. Start by sewing your first two columns together. Sew the third column together and then you're going to stitch the rick rack onto that column. Use a coordinating thread and your 1/4" piecing foot to keep the rick rack lined up with the edge of your column. 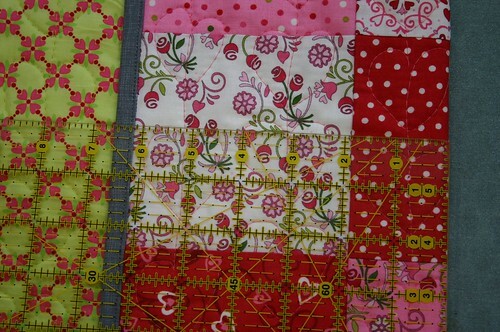 Now, stitch your piece with the rick rack trim together with the block you first sewed together. 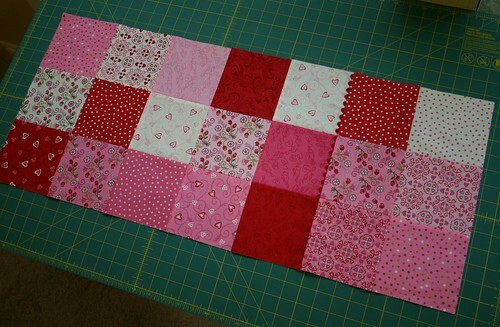 Press and continue to sew the rest of the blocks together. Here I have all of the 21 squares sewn together. Now, we're going to get the piece ready for quilting. 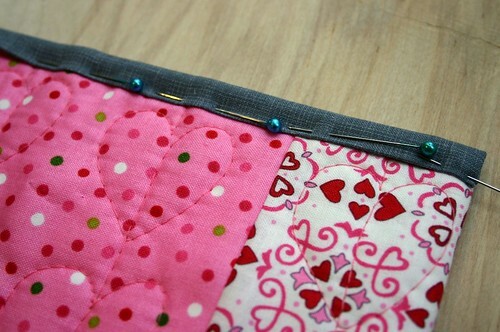 Lay your backing fabric out (right side down) and pin or tape to the surface you're using. Layer with the batting and the patchwork top you just made. 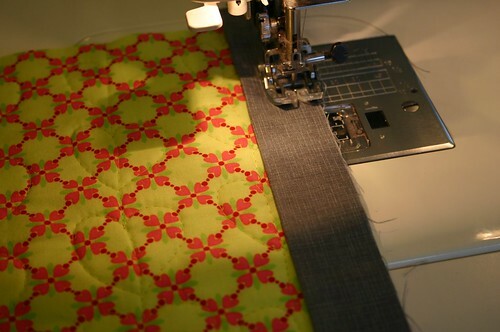 I like to pin baste my quilts, but you can also spray baste or use whatever method you like. I've been wanting to try some different quilting designs and this project was nice and small to be able to try something new. I thought of a "chained heart" design. 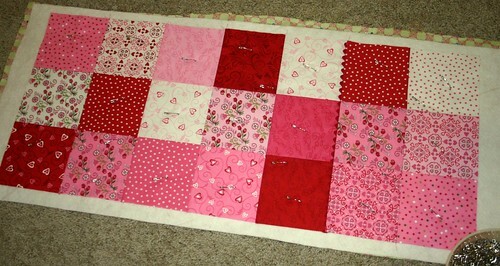 I just quilted two chains of the hearts in each column. Some hearts are big and some are small and some are a little more wonky than others, but it was fun to try a different quilting design. 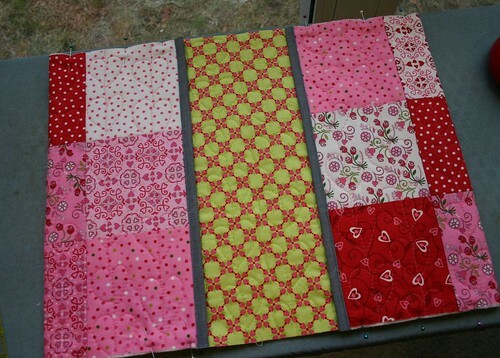 Once you are finished quilting, you can trim the piece up to about 13.75" x 31.25". Then grab the fabric strips you are using for binding. I'm using some extra binding left over from a quilt. Prepare your 2.5" strips by folding them in half lengthwise and pressing them with the iron (just like a normal quilt binding). 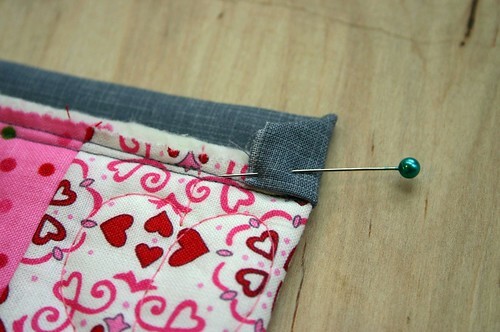 Attach the binding to the inside pocket edges from the back and wrapping it around to the front. I top stitched the binding from the front to finish off each edge. Fold the ends toward the center, measuring them about 6.5" with your ruler. Stitch close to the edge along the top and bottom of the piece. This will help hold everything in place when attaching the binding to those edges. Use the remaining binding and attach it to the top and bottom edges. I chose to hand stitch these portions of the binding closed and the picture above shows how to cover the edge. 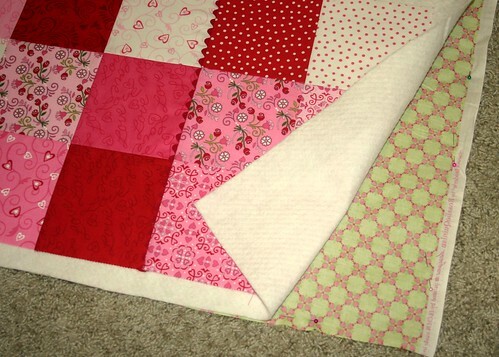 Fold the short edge in (about 1/2") and fold the fabric down in, to create a angled corner. Then fold the binding around the raw edges, encasing the corner and hand stitch it on. And, that's it! Now you have a great place to keep all your favorite Valentines. I hope you enjoy making one of these. I think they could be made in many different sizes and styles to suit your taste! Thank you so much to The Intrepid Thread for sponsoring the giveaway for my stop on the tour! Please leave a comment on this post to be entered to win a $25.00 gift certificate to The Intrepid Thread and tell me something that you like or don't like about Valentine's Day! I'll choose a winner by random number on February 15, so you have lots of time to enter. February 14 - Happy Valentines Day and the Grand Prize Winner Announcement!! I love the colors of valentine's day...and now I love that my BFF's daughter was born on Valentine's Day last year! I love Valentines day for it's meaning, but at the moment I hate all the publicity associated with the day! That's a cute keeper, and can be used for lots of different things. Thank you! I love special chocolates. And, I'm a sucker for holiday M&Ms. Love Chocolate and Valentine's Day gives me a reason to eat it. Thanks for the great tutorial and a chance to win! This project is so cute and it's a great idea! I would have to say chocolate is on the Valentine's list. Yum! This is so cute! I love all the thought little kids put into making Valentine's. Have a good one! I don't like hype about days like Valentines. But I do like that it makes people think about each other a little more than usual; maybe. We should be the same to one another everyday....thanks for the giveaway. 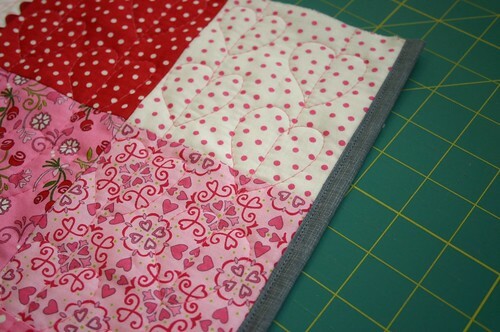 The heart quilting is so cute! I'm not really a fan of valentine's day. Seems too commercialized to me. What a charming project! My favorite thing about Valentine's Day is simply the focus on love - positive, happy, giving, caring! A great holiday! The fun thing on Valentine's Day that I like to making all kinds of food items in heart shapes....pancakes at breakfast, my bread for my sandwich at lunch, cupcakes in heart shapes for dessert.Silly, but fun! I like getting Valentine's cards from my children, melts my heart! 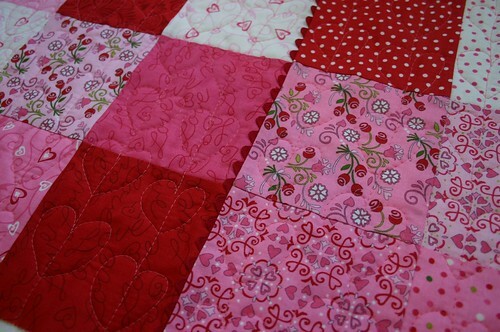 love the hearts you quilted...what I love about valentines day are the chocolates, flowers, special dinner, and just the romance that is in the air! 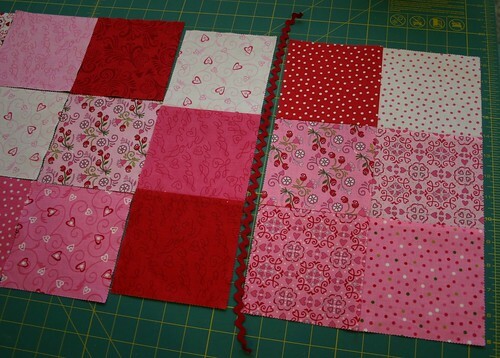 I love that Valentine's Day comes along and brightens up winter with all that great red and white and pink. And it comes with chocolate! I love any excuse to be festive and eat chocolate, so Valentine's Day is great for me! I love all the pretty floral displays at the grocery stores this time of year!! Thanks for the cute tutorial. Love it. Valentines Day is a "cute" holiday. I love the color red so this holiday brings out the "red" in me. The decorations make me smile. My husband and I really don't celebrate the day but I still like the sentiment that surrounds the day. Thanks for the great giveaway. That is darling! Thanks for the tutorial!! I love all of the PINK that takes over the world! :) It makes everything so pretty! i like chocolate... easily available, wrapped all pretty, chocolate. i'm sort of kidding - my real answer is that i love how affectionate my girls get this time of year. "i love you, mama!" The thing I love most about valentines day is the chocolate! I don´t celebrate valentine day but love the beautiful chocolate boxes. Valentine's Day is also my birthday...so as a kid, I thought everyone was celebrating for me. Great tutorial...and great giveaway. Thanks. I love the extra hugs and kisses from my kiddos! I do like the fact that Valentine's Day gives us the push to let our loved ones know that they are truly loved and appreciated. I do not like all the commercial pressure and retail hype associated with Valentine's Day lately! Thanks for the great giveaway! That is a super card holder, love your quilting on it too. What a great tutorial! I love Valentine's Day - a whole day all about love. And the Reese's hearts don't hurt either! Thanks for the chance to win! I like the little valentines that are sent with the kids. My favorite color is red so I also like seeing all that extra red in stores. I like your tutorial very much. It would be a great place to put my saved cards and notes from the kids. Thanks. Great tutorial for a special card wallet. Well done. I'm not a big fan of Valentine's day...seems forced to me...but I do enjoy the chcocolate peanutbutter hearts available in the stores around then. Thanks for the chance at your giveaway. I love all the pink and red and hearts. My daughter is in love with all of the decorations so it makes going to the grocery so much fun. I do like valentines day, although when the kids get to a certain age (eldest in 3rd grade but it's a mixed age class) it's hard to tell when to stop with the valentines for their class, so this v-day I am confused. That said, I like the idea of a day to celebrate the ones we love! I just love the abundance of chocolate! Yummo! i like including extra touches of love into my daughter school lunch! What a great tutorial. This is so cute and would look great in so many combinations. Thanks for the tute and giveaway. I hate the mass commercialisation of Valentines Day! I've just been out shopping and everything is red/pink and heart shaped! 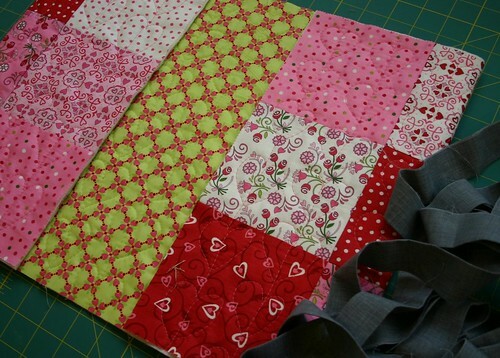 Love your project and especially the quilting! Thanks for the tut! I love the sentiment of Valentine's day but hate how commercialized it has become. meh, it's just another day. Wonderful tutorial and I can see this used in various fabrics to hold different types of 'memories'. I'm not into a lot of red/pink heartsie stuff - but love getting the chocolate roses! I think it's nice to have a day about love but it's so commercialized that I always feel guilty that the hubs and I don't really participate - we love each other every day! We don't celebrate Valentines day. But we try to surprise our loved ones with little notes or gifts during the year. When I was little my mother bought my sister and I add-a-pearl necklaces. Each year for Valentines and birthdays she would add a pearl to the necklace. Now that I am older, the necklace is complete and a great reminder of my mother's love. I love the 'color' of Valentine's Day - red, pink, white. Then you can throw in a few other colors for fun, if you want. It bugs me that people have forgotten that Valentine's day started as (and still is) a saints day. So when others go on about it being created by the card industry I want to correct them. It really is a holiday that was started because someone so loved someone else! This is a great tutorial. Thank you for being so precise and taking lots of photos. I think that I could make one too now. For me, the worst thing about V-day is thinking up a gift for my hubby! I'm the worst giftgiver on the planet! I think I love Valentines Day because of all the beautiful images on all the cards, etc., and mostly because there is so much PINK all around me! Love pink!! Valentine's day to me has gotten too commercial (was it ever not?) just like Christmas. We don't really celebrate Valentine's day here because we make sure to show and tell our love for each other every day. cutte! I don't need a Valentine's Day card keeper (for the one card I receive form my mom every year!) but a slightly smaller size will keep my coupons perfectly! thanks!!! I also think it's too commercial...I don't like an industry telling us we need to give cards, gifts, go out to dinner, etc. To me, my wedding anniversary is much more meaningful. But, I think Valentine's day can be very fun for kids. I have mixed feelings about VDay. Favorite thing would probably be the fun colors in the midst of dreary winter. Thanks for the tutorial and the giveaway opportunity! I like that V-day gives me a chance to get a babysitter and grab a romantic dinner out with my hubby! Thank you for the lovely tutorial. I have lots of little notes and cards my children (now 23 and 26) made over the years. This would be a lovely way to save them. I love the colors of Valentine's Day. All year long I prefer the cool blue tones, but winter makes me crave something bright and Valentine's day offers that little boost of brightness. Neat idea--could be used for a number of things!!! I enjoy thinking up something romantic to do for my husband on Valentine's. My favorite thing about Valentine's Day is the sale of discounted "good" chocolates after Valentine's Day. Special dark is the best. Thanks to you and Intrepid Thread for this giveaway. I especially liked your use of ric-rac on the card keeper envelope and the Brrr! quilt. I love Valentines! Everything about it is so fun! The candy, the love notes, the company. What's not to love? Valentine's Day is such a fun day-- a time to show loved ones how much they mean to you... it doesn't have to be a big or expensive thing-- some of my most cherished Valentines have been the handmade cards my girls have given me over the years.. I love all the pretty pinks and reds, the flowers-- both roses and wildflowers, and (best of all to a chocoholic like me) the delicious chocolates!!! :-) Happy Valentine's Day, everyone! Thanks for a wonderful tutorial. Valentine's day is special to me. My daughter ( my first baby) was "made" on Valentine's Day. Such a cute idea! I like all the colors associated with Valentine's Day, as well as, all the cute little cards my son's preschool make for each other. Thank you for a great tutorial. I like Valentines Day as its for everyone! This is cute - I like the grey you put around the edges. Sort of grounds all that pink and red. Valentines is okay by me because it's ALL about the chocolate. And I also am all about the chocolate. I like that Valentines Day is a day that I don't have to cook dinner! Wahoo! I usually cook a nice dinner on Valentines Day because I don't like long lines/waiting for a table/feeling rushed to eat at restaurant's. But I love making my family feel special and loved. What a beautiful card keeper. Thanks for a grest tutorial. I really like this design. You're right, this is the perfect size to practice quilting on. I like the idea behind Valentines, I just don't like how commercial it is. Seems like December isn't over before the stores have their Valentines Day displays up. Thank you and the Intrepid Thread for a super giveaway and a chance to win. This is a fun project, love it! One thing I do like about V-day is seeing all the fun decor everywhere. It adds color to winter! I am not a V day fan. When my husband & I first got married we didn't have a lot of money so V day celebrations went out the window and we have just continued to do that. Our Anniversary is in March so we usually do something bigger for that. What a cute and useful project. Perfect all the little notes and cards I receive from my little ones on V-day and all through the year. I am not a huge fan of Valentine's Day. I don't like all the junk that comes home from school. This is such a cute project! Thanks for sharing it! The thing I like and dislike most about Valentine's Day is chocolate. I like that I get it and eat it and dislike that my clothes are too tight afterwards. I have a bit of a problem when it comes to chocolate and self-control. I love V-day, but I don't love all the candy floating around the house! I like getting a present from my husband. I miss the candy since I am now DIABETIC!!! I love any holiday with an emphasis on candy, chocolate, and date nights with my sweetheart! xxxooo Thanks for the giveaway and the sweet tutorial! Chocolates and roses, of course :) thanks for the chance to win! I love the big heart-shaped boxes of chocolate! I love flowers and chocolate on Valentine's Day... sweet in different ways. 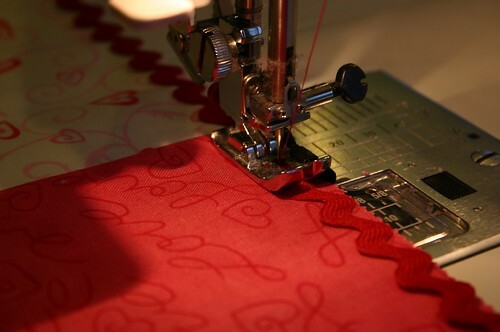 I love all of the great fabrics that come out for Valentines Day !!! and of course the great things to make with them! ! I love Valentine's Day because my husband and I take a little time out to make each other feel special. Valentine's is just another day for me. I don't like or dislike it. I just don't get around to doing anything really special most of the time. What a cute little quilted item. It would work as a Placemat too. 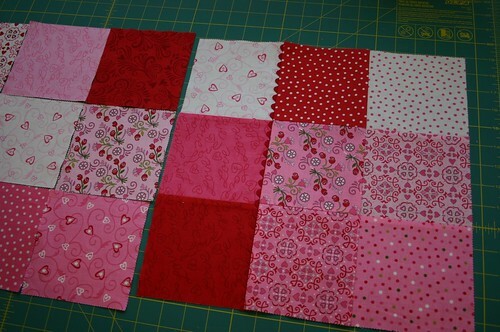 I can practice some FMQ on one to go along with the heart theme. Thanks for being on the Blog Hop! I love that Valentines Day reminds us to focus on our loved ones and to show them how much they mean to us. I don't like that fact that they have made it so commercial! My husband and I had our first date two days before Valentine's Day, so it's always been special to me because it all started then! Eleven years later, it's still wonderful! What a cute idea and great tutorial. Thank you. I think the biggest complaint I have about Valentine's Day is that no matter where you go to eat or what traditional type gift you buy the prices for that one day have been doubled, if not more JUST because those places know we must buy those gifts or eat in their restaurants. I think it's terrible. A few years ago I told my husband that I do NOT want roses on Valentine's Day no matter how much I love roses. I hate the fact that he can buy that same dozen roses the day before for about $10 or less in some shops near us but on Valentine's Day those same stores sell them for $50 a dozen or more. I have never been much of a valentine's day fan, but my son is going to be born on Feb 15th this year, so I think I'm gonna start loving the holiday a bit more. What a great tutorial.....and it can be used for so many other things too. I love the touch of rick rack! Thanks for sharing and Happy Valentines' Day. great tutorial = thanks! i'm fairly neutral on valentines day. i don't mind a sweet little handmade card but the over-the-top celebration is too much. I love all the extra thought that goes in to the day. I love Valentine's Day (but not the commercialism). 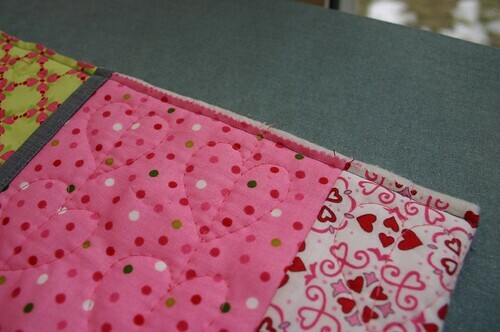 I love pinks and am excited to incorporate some of my pink fabrics into this tutorial for a few special kids in my life. Cute tutorial! I'm a lover of all things pink! I love Valentine's Day -- love the colors of it, and the romance! It is a bright spot in a long winter if you live in a snowy area. I love the availability of CHOCOLATE!!!! I love homemade Valentines from my kids! Thanks for the chance to win! I love making things for the family for Valentine's Day. I don't like how the advertisements try to make you spend so much money. It's about the heart! I'm with Barb McD -- chocolate is the best part of Valentine's Day. Really fine chocolate. OK, I know, I'm such a romantic! thanx for the pattern; it's good for lots of things to keep. but one of the nice things about valentines are the flowers ... red, or pink, or white. love the bouquets, even those from the local grocery store, picked up at the last minute! Neat idea! This is the first time my son has been in school to celebrate valentines and it's great seeing how excited he is about making cards for all his friends! Don't mean to be a downer but the thing about Valentine's Day is it is such a "Hallmark" holiday. Would rather have a spontaneous gift from my darlin' husband (Too much to ask for???). Would love to win a gc to The Intrepid Thread. Thank you for the great tutorial. 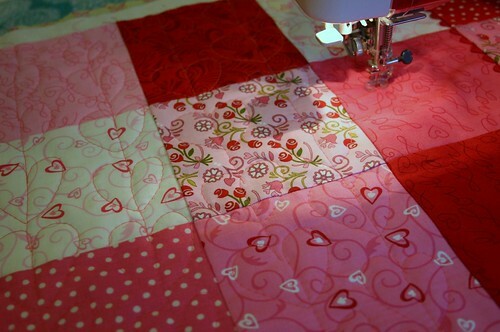 I like the chained hearts quilting design. Valentine's Day is a good excuse to eat chocolate (if you need one!). What a clever idea - and so cute. I can see this being used for a lot of the artwork children do. Thanks for sharing. This is really cute, way better than the manilla envelope I keep special cards in! I like Valentine's Day. I love remembering the giant heart-shaped chocolate chip cookie my Mom made for each of us when we were kids. I'll never forget that. what a lovely project! Thanks for sharing! Hmmmm I love that Valentines day in a good excuse to get and give gifts! I like it because I can "use it" as another way to let my family know I love them. awww this is awesome! I'd make this in a heartbeat if I had the cute pink fabrics. I might just make it anyway. My favorite thing about valentines day is knowing that I'm already with the person i love and will be forever. I like to spoil him by making his favorite food. 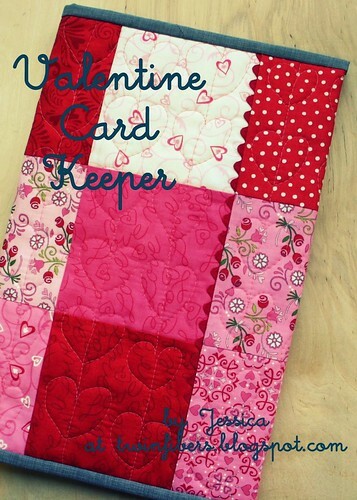 A card keeper is a very clever idea! I just like that we celebrate LOVE on Valentine's day. What could be better than that? very cute card holder. I am a little indifferent to Valentine's day. I do send cards and get my hubby and kids some chocolate but there are other holidays that mean a whole lot more to me. That is so sweet. It would be lovely for other cards as well. Thanks for sharing this excellent tutorial. Hooray for Valentine's Day! My favorite thing about it is knowing that so many people have the joy of finding a handwritten card in the mailbox. I try to make sure that happens for my loved ones. You know, I actually should make this... I know several members of my family that hold on to every card they ever received and this would be much cuter than a ziplock baggie or cardboard box or just stacked on a shelf. Thanks for the great idea! My cards and letters from my children are just scattered in the drawer of my nightstand. I'm making this for sure! I love Valentine's Day because of the letters I get from my husband and my now grown children. What treasures! I like spending time with my husband, but I don't like how expensive everything suddenly becomes! We don't usually do anything for Valentines Day but this year, now that my 3 year old can help, we will be making peppermint cream hearts for 'daddy'. Great tutorial thank you, I will definitely be making one of these. Great tutorial! Love the idea; I can really use something to hold all those cards I just can't throw away. =) What I love about Valentine's Day...hmmmmmm. I love that it forces my husband to take time out and think about what I might like to do. He's very considerate but having a family, it's not often that it is just about what I would like. I like Valentines Day for a fun February holiday of love but I do dislike the media advertising & the push to make it such a commercial holiday. My anniversary is also in Feb. so I love the whole month. What a cute project. Thanks for the tutorial. I love Necco candy hearts which are only available at Valentine's Day. Thanks for the tutorial & chance to win. I mostly just don't like to celebrate my birthday or holidays where you are expecting something. Thanks for the tutorial and a chance to win. Great tutorial - I love the sweetness of Valentines Day and by that I mean the chocolates!! I think we should remember to show love to people everyday of the year but I like that Valentines helps us remember at least once. But I don't like how commercialized it has become. I love a Valentines day without expectations, especially my own. This Valentine's I'm actually going to be away from home, and that's okay with me. Thanks for the giveaway! I just love all the gushiness of Valentine's Day although I never my hubby and I don't really do anything for it. I think your love should be shown every day, not just on that one "special" day. Every day should be special. It's the chocolate and flowers holiday! I Love those both. love the chocolates!! This is a cute little card keeper. I just love the excuse for us all to get (or allow ourselves to get)chocolates and or candies that are totally without calories. I love the chocolates! And I've learned to celebrate any relationship I have on Valentine's Day. Otherwise I would always feel bad for being single. I love the fact that there's usually chocolate and wine involved :o) Thanks for the great tute and give away. Chocolate! Russel Stover's caramel and truffle hearts are the best. What's not to like about Valentine's day???!!! I love how the children get excited about giving and getting valentines from their classmates. Great tute - thanks. I like that there's no guilt associated with enjoying a few bites of chocolate candy! I like that it's another excuse for chocolate. The holder is a great idea, thanks! Something I like about Valentine's Day, even though my husband died a couple of years ago, there are still people in my life to whom I can give wonderful Valentine cookies or cute homemade Valentine goodies. I remember being so careful to make sure the messages on the candy hearts were the right ones for each classmate. Didn't matter with the girls but heaven forbid, you gave I luv U to a guy, even the one you secretly luved!Now I watch my grandkids as they read the messages and giggle. Some things never change. Don't like the feeling that I HAVE to do something special, should be doing that all year long. I still give my husband a card, but if he didn't give me one (unlikely), that would be fine too. Love the added rick rack, adds that extra something that makes the project shine. This is super cute! The only thing that I like about Valentines day is all the pink that I see. This is such a unique and creative project. Thanks for sharing. I love Valentines Day because my six year old wears pink and red all month. I love the colors associated with Valentines Day, and I also love the heart symbol. Thanks for a neat tutorial! I do not like the pressure to buy, buy, buy high price items. I do like the idea of showing love to friends and family. 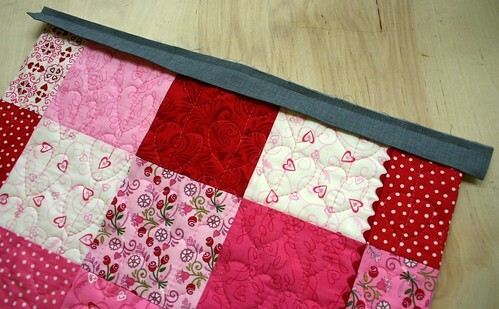 What a cute tutorial, love the quilting. I love getting handmade cards from my kids and husband. I love the colors involved in valentines day. The reds and pinks are just great. I like you valentine saver. Great idea. I don't like the commercialization of holidays, including this one. I've heard men say it was a holiday created by the cards companies to sell more cards. LOVE the chocolates...but sad that some people feel left out on this day of love (widows, people w/out a significant other, etc.). My parents were married on valentines day. It wasn't till I was married that I realized how special that was. It's a little strange thinking about your parents being young and romantically in love with one another. So when we celebrated their anniversary we kids got to have a valentines day with our honey, too!!!! This is such a neat idea!!! I love the excuse to eat lots of dark chocolate for Valentine's Day, but I do not like that our anniversary falls so close to Valentine's Day as we will usually end up combining the two! I love this idea, it would be good for christmas too. Or, you could make one for each person to keep their birthday cards in from year to year! I'm not a big fan. I like it when my husband wants to take me out and buy me flowers because he wants to...not because of a commercial holiday. I do like the day after though...lots of cheap candies! I would rather show my love all year long. Thanks for the tutorial and giveaway. I love the candy that comes with Valentine's day but not all the hype. Really cute!! I love the ric-rac!! I love Valentine's Day for small children. It's fun to have a holiday to share pink and red even with boys. LOL Love the card holder. I like how excited my students get about valentines day more than anything! Thanks tor the opportunity. I hate the hype. Dont get me wrong love the wife and all but I love her every day not just once a year. It's bittersweet. My first wedding was on Valentine's Day. He figured he couldn't forget it if we got married on that day . Now I'm remarried to a really romantic guy, who makes everyday Valentine's Day. On Valentine's Day I like to make something cute like a bracelet or a necklace for my daughter along with some flowers. She loves it! I know we are talking "all things Valentines" but what is better than Valentines Day for crafts? EASTER! I cannot wait for Easter and all the crafts it brings! I don't think there's anything not to like! Chocolate, a meal out, sometimes flowers...special times for sure with my family. 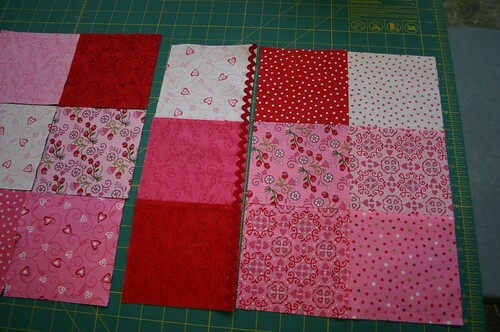 I love red and any variation thereof, so Valentine's Day is so festive with all the reds and pinks. Nice Valentine Card Keeper. Love the quilted hearts. I have never seen a Valentine Card Keeper. Thank you for the great tutorial...just darling! Regarding what I like about Valentine's Day: I love watching young students pass out their special Valentine's! I'm not a big fan of Valentine's day because every always seems so pressured and stressed out about it. We should make a big deal about our love for each other everyday, not just one day of the year. Love the idea of a special card holder for all the little notes from the kids! What I LOVE about Valentine's Day is my husband. He gets the sweetest card and writes the perfect note in there to me. I also love the fact that my 4 1/2 year old son is also starting to like making his own Valentine's Day cards. Thanks for the chance to win your "sweet" giveaway. I love Valentine's Day as it's the day hubby and I got engaged ... however I don't like how commercial it has become. This looks really awesome. Thanks for sharing. I don't like valentines day very much. It has become to commercial. I love small attentions, but that could be anything, just one flower, a handwritten card or a good homecooked diner for two. It's the little things that matter to me. I love any excuse for a day of chocolate and flowers :) thanks! Cute tute! Thanks for the chance to win your giveaway. I love that there's a reason not to cook and for my husband to take me out to dinner.